Thrift and consignment stores are my favorite places to go for clothing for my family of three. I enjoy the hunt, and I can often find garments for each of us that are in new or like new condition. More on that another time. Outlet stores can be great, too. But that's not what I want to talk about today. 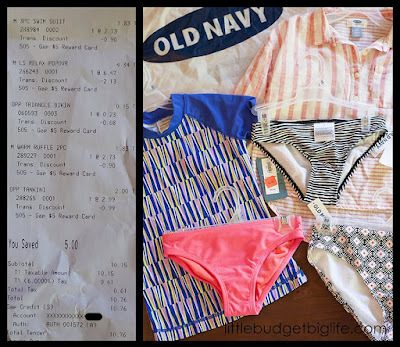 For the items I prefer to purchase first hand, Old Navy is one of my favorite places to shop. Their clothes are current and fun, and their sales can be amazing. Take last weekend's haul, for example. I was in the Carolinas, and I stopped by Old Navy in Spartanburg. It happened to be a big sale where everything in the store was marked down, but I made a beeline for the girls' clearance racks. I entered the store with a $5 off coupon from a previous purchase and I was determined to spend it before it expired. Pip is growing like a weed, and swimsuits are something I like to buy new. She had a few odd and end pieces--mix and match options are her favorites--and I hit the jackpot with this sale. All the swim items that I selected were already marked down because they were "missing pieces" or "online exclusives," but then they were an additional 50% off. The shirt was thrown in because my sister in law found a coordinating one for my niece and we thought that was just fun. The total I paid for these 5 items was $10.76. The receipt says I saved $5 because of my coupon. But the original retail of the items (if I calculate the bottoms as half the price of their 2-piece swim suits, since they're not normally available alone) was nearly $64. That's a savings of approximately 85%. Another way to look at it is that it cost just over $2 per piece. That's a great value for items that I know will be worn until they are worn out. Old Navy has these giant sales every once in a while. I accidentally walked into this one, but I was glad that I did. Disclaimer: If you look closely at the receipt you'll see that this purchase was charged to a Gap credit account. We do not live on credit, and I am not encouraging anyone to open a credit card, particularly a store credit card. This is an account that Chris and I opened years ago, when we were planning to buy several garments from Gap (we were enticed by the discount we got on the first purchase). This is one store account that we never closed; there's no fee, we pay it off any month that we use it, and we receive rewards for shopping at the Gap family of stores, which I do every few months. That was a STEAL! Awesome! I hear you about store credit cards. We don't live on credit either, but we have Kohl's cards. The discounts are nice! Yes! If you're going to be shopping there regularly anyway, and if you're going to pay it off as soon as you use it, they can be a real advantage.